Case Report | Volume 3 | Issue 3 | JOCR July-Sep 2013 | Page 38-41 | Aslan A, Konya MN, Sargin S.
Afyonkarahisar State Hospital, Department of Orthopaedics and Traumatology, Afyonkarahisar /Turkey. Dr Ahmet Aslan: Afyonkarahisar State Hospital, Department of Orthopaedics and Traumatology, Afyonkarahisar /Turkey. Introduction: Distal median nerve masses may be developed post-traumatic or non-traumatic. In this paper, we aim to present a 52 year old female case with a postraumatic neuroma of the median nerve in the left wrist. Case Report: A 52-year-old female patient had accidental incised wound over her left wrist which was primarily sutured. She presented 6 months later with unrelieved pain and growing swelling at the wrist. USG showed solid mass of size 2×3 cms. Intraoperatively the mass was seen to arise from medial nerve and careful excision was done protecting the nerve. At one year follow up the patient is relived of her symptoms with no sensorimotor deficit. Keywords: Neuroma, wrist, median nerve, nerve ınjury. Broad spectrum of tumoral lesions and neoplasms may occur in hands and wrists. Soft tissue, skin or bone tumors should be considered in the differential diagnosis of the hand tumors. Neuromas are the most common solid peripheral nerve tumor frequently seen in 30-60 ages [1-3]. Neuromas can originate after trauma to the nerves and such cases are rarely reported in literature [4-6]. In this paper, we aim to present a case with post-traumatic neuroma of the median nerve on the left wrist diagnosed by USG-clinical findings and confirmed with pathological reports. A 52-year-old female had accidental incised wound over her left wrist which was primarily sutured elsewhere. She was reffered to our centre 6 months after injury with unrelieved wrist pain and progressively growing mass on the wrist. Clinially the mass was subcutaneous, mobile, non pulsatile and appeared solid. USG showed a solid tumor of size 2 x 3 cms and a decision for excision of the mass was taken. Local anaesthesia was given over the area and skin and subcutaneous tissues were dissected to isolate the tumor. It was found to be originating from the median nerve (Fig. 1). The tumor was carefully excised from the surrounding tissue trying to keep the nerve intact. Intraoperative examination was possible as patient was under local anesthesia and minimal motor disability and hypoesthesia were noted (Fig. 2). Tumor was excised and wound sutured in layers. Histopathological examinations revealed wallerian degeneration in evolutionary phase as revealed by disorganized growth in axonal and perineural structures (Fig 4). The patient had a normal outcome with no pathological findings after one year follow-up. Hand injuries must be carefully examined because of anatomic and neurovascular complexity of hand and wrist. Peripheral nerve injuries are divided into two groups; incisions and lacerations. Sharp devices, gunshot injuries, occupational injuries and traffic accidents are the most common causes of hand injuries[7-9].In a study, Seddon divided nerve fascicle injuries into three types; noropraxia, aksonothemesis and norothemises . It is stated in this study that Noropraxia, does not need any surgical treatment, wallerian degeneration does not occur and the injury can recover completely . In axonothemesis, axonal integrity can be broken but endoneural tubes remain contact. This condition can be seen after more serious compressions, crushes and traction injuries. Motor, sensorial and otonomic disfunctions can be present with complete wallerian degeneration. In norothemesis, when the nerve is completely disfonctioned, internal anatomy of the nerve can also be damaged and motor, sensorial and otonomic disfunctions at the distal region of the injury become significantly present . Clinical and electroneuromyographical (ENMG) study results can be the same with axonothemesis. When the nerves are partially or completely damaged after injury, axonal regeneration initiated by proximal part of the nerve is mostly resulted as neuroma. In adults, mean regeneration rate is 1-2 mm/ day . If fibrous barrier has been developed in injury site, than the axons cannot be able to find enough room to grow up and form a mass with fibrous tissue which is called neuroma . There are some articles about post-taumatic or non-traumatic median nerve masses in the literature. In 1969, Kanagasuntheram and Wong  reported post-taumatic neuroma. A two cm sized neuroma occured after distal radius fracture and trapped in fracture line was disgussed. After having median nerve excision for neuroma, nerve ends were sutured and the patients showed remarkable improvement in the four-mounth follow-up. In the recent studies; Chen et al. reported a 42-year-old female cut the wrist in a suicide attempt and had subsequent tendon and median nerve repairment followed by rehabilitation. After neuroma on the median nerve region was confirmed by the excision of the lesion in the surgery, nerve repairment with a nerve graft was performed and the patient’s symptoms improved significantly. Tollestrup et al. reported that distal traumatic median nerve neuromas are mostly painful and related with recurrent carpal tunnel syndrome which is generally managed with hypothenar fat pad flap. Non-traumatic madian nerve masses on the wrist were also reported. İkeda et al. reported a case with calcificated schwannoma. Hubert et al. reported a schwannoma sized 4.0×0.5×1.2 cm and located in carpal tunnel. Bagatur and Yalçınkaya  reported two giant lipomas in carpal tunnel. In a study of Özdemir et al., 10 of 14 patients had tumours located in the median nerve distribution area, whereas 4 were found on the ulnar nerve distribution. Four tumours were at the wrist level, 3 at the palm level, and 7 at the digital level. Our case was a post-traumatic neuroma of the median nerve on the left wrist and the diagnose was confirmed by clinical, ultrasonographical and electrodiagnostic examinations. Further confirmation with pathological reports was also done. After one-year follow-up, the patient had normal clinical findings without any pain or neuromotor loss. In addition, opposition loss is frequently present in distal level median nerve injuries. However, in our case, the patient had complete nerve injury with no opposition loss or any motor deficits. Spontaneous anastomosis with N. Ulnaris was also revealed by EMG reports during further investigations. In conclusion, the masses on the wrists and hands are not rare and can be seen as posttraumatic or non-traumatic. 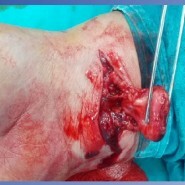 However, trauma related soft-tissue masses on the wrist have usually been reported as case reports in the literature. Therefore, hand injuries, must be carefully inspected by experienced orthopedic surgeons because of anatomic and neurovascular complexity of hand and all possible outcomes should be considered in the management of these cases. 1.Sookur PA, Saifuddin A. Indeterminate soft-tissue tumors of the hand and wrist: a review based on a clinical series of 39 cases. Skeletal Radiol. 2011;40(8):977-89. 2.Plate AM, Lee SJ, Steiner G, Posner MA. Tumorlike lesions and benign tumors of the hand and wrist. J Am Acad Orthop Surg. 2003;11(2):129-41. 3.Kang HJ, Shin SJ, Kang ES. Schwannomas of the upper extremity. J Hand Surg Br. 2000;25(6):604-7. 4. Kanagasuntheram R and Wong WC. An unusual case of neuroma of the median nerve. J Neurol Neurosurg Psychiatry 1969 32: 428-431. 5. Chen KH, Lee KF, Hsu HC, Huang WC, Hsiao KY, Fang KM. The role of high-resolution ultrasound in the diagnosis of a traumatic neuroma in an injured median nerve. Am J Phys Med Rehabil. 2009 ;88(9):771-4. 6. Tollestrup T, Berg C, Netscher D. Management of distal traumatic median nerve painful neuromas and of recurrent carpal tunnel syndrome: hypothenar fat pad flap. J Hand Surg Am. 2010;35(6):1010-4. 7. Flores AJ, Lavernia CJ, Owens PW. Anatomy and physiology of peripheral nerve injury and repair. Am J Orthop (Belle Mead NJ). 2000;29(3):167 73. 8. Robinson LR. Traumatic injury to peripheral nerves. Muscle&Nerve 2000;23(6):863-73. 9. Sunderland S. Nerve injuries and their repair: A critical appraisal. New York: Churchill Livingstone; 1991. 10. Seddon HJ. A Classification of Nerve Injuries. Br Med J 1942;2(4260):237-9. 11.Dvali L, Mackinnon S. Nerve repair, grafting, and nerve transfers. Clin Plast Surg. 2003;30(2):203-21. 12. Ikeda K, Osamura N, Kasashima S. Ossified median nerve schwannoma: a case report. Hand Surg. 2012;17(3):371-3. 13.Hubert J, Landes G, Tardif M. Schwannoma of the median nerve. J Plast Surg Hand Surg. 2013;47(1):75-7. 14.Bagatur AE, Yalcinkaya M. Unilateral carpal tunnel syndrome caused by an occult palmar lipoma. Orthopedics. 2009;32(10). 15.Ozdemir O, Ozsoy MH, Kurt C, Coskunol E, Calli I. Schwannomas of the hand and wrist: long-term results and review of the literature. J Orthop Surg (Hong Kong). 2005;13(3):267-72.